Ideal Tax Solution, LLC advocates the active participation of taxpayers as important links between the IRS and taxpayers across the country. TAP committee members serve an important function by providing valuable insight into improving IRS customer service. Only by continued monitoring and organized input can taxpayers truly have an effective impact on the rules and regulations of the tax code. Ideal Tax Solution, LLC applauds any effort which better facilitates an engaged and informed Internal Revenue Service. The TAP makes suggestions to the IRS based on taxpayer input and issues which are identified as problematic or potentially disruptive to the IRS tax collection process. The Taxpayer Advocacy Service, an independent organization within the IRS which makes recommendations and helps resolve problems, oversees and supports the TAP program. “TAP members provide an important voice for taxpayers and provide valuable insights to help run the nation’s tax administration system,” says IRS acting Commissioner Steven T. Miller. 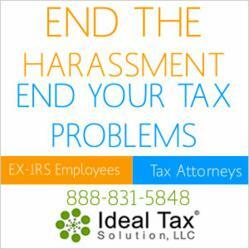 Ideal Tax Solution supports any legitimate organization or initiative which allows taxpayers’ voices to be heard and acknowledged by the IRS. Only by continued monitoring and organized input can taxpayers truly have an effective impact on the rules and regulations of the tax code which govern its enforcement. TAP members are U.S. citizens with wide ranging demographic and geographic diversity, which provides balanced representation from around the country, including Puerto Rico. They volunteer for a three-year commitment and are expected to devote two to three hundred hours a year to panel activities. The tax help specialists at Ideal Tax Solution stay abreast of any TAP discussions which could have an effect on a taxpayer’s tax liability.